Squid fishermen in and around Monterey Bay are experiencing early success this season with California market squid, which may be a result of a couple of happy accidents. Half Moon Bay fisherman Michael McHenry says conservation efforts such as closed areas, a ban on weekend fishing and limiting the areas accessible to light boats have allowed the squid population to flourish. While the majority of squid fishing in California takes place in the southern half of the state, he said the bloom of California market squid in Monterey has brought many fishing boats north. The Market Squid Fishery Management Plan, set forth by the state of California in 2005, limits the annual total California market squid catch to 118,000 tons, most of which is exported to China. When the quota is reached, fishing ceases. There is no denying that conservation efforts are important in squid fishery management, said William Gilly, a Biology Professor at Stanford University’s Hopkins Marine Station, but he said he thinks there may be other factors that play a larger role in the recent market squid abundance. Gilly has been studying the much larger Humboldt squid for almost 15 years and believes that their recent decline is related to the increase in market squid. 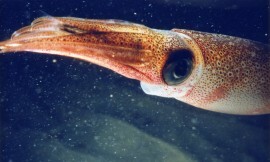 The Humboldt squid, which have been absent from Monterey Bay since the last El Niño in 2010, are a natural predator to the California market squid. Since then, California market squid fishing has been very good, indicating a correlation between the two species. Gilly also cites natural seasonal cycles relating to spawning patterns as a factor in market squid population fluctuations. “There's a seasonal increase in the California market squid in Monterey Bay every year. They spawn in the bay every spring and throughout the summer and into early fall.” Gilly says that an early start to the fishing season this year may also play a role, essentially giving the Southern California squid unmolested spawning rights for the winter months. It's a happy accident that's working. Gilly and McHenry agree that the California market squid are important for the ecosystem both as predators and as prey. According to Gilly, they are a keystone species, gobbled by basically everything in the ocean. Currently, there are no numbers on how many squid of either type are in the ocean. Data is based on observations of market catch and research surveys conducted by the Monterey Bay Aquarium Research Institute. However, Gilly said sonar technology that could accurately monitor the biomass of the Humboldt squid and the California market squid does exist. Combined with state support, he said, this technology has the potential to use squid populations as an advanced warning system for climate change.